15"/28cm Holds 3 cups/24oz. Perforated on all four sides for effortless pressing. Cast aluminum wtih extra large stainless steel hopper. 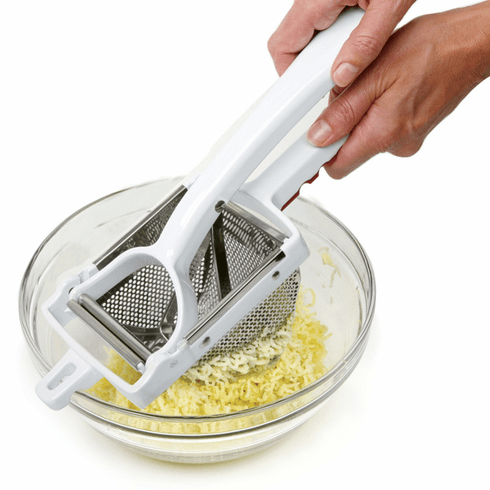 Potato ricers incorporate air into your boiled potatoes, making them light and fluffy. A quick and easy way to make smooth and lump free, perfect mashed potatoes, sweet potatoes, applesauce, pears or carrots, gnocchi and spaetzle. Use to squeeze excess water from sliced or grated potatoes for crisper chips or hash browns. Efficient, high yield output. Grooved, rubber insets for soft grip handle and rest positions for pots and bowls. Disassemble for easy cleaning. Press cooked potatoes, peeled or unpeeled quickly and easily.